Together with his mother Tarek (11) has to flee from Palestine to Jordan. Having been separated from his beloved father in the chaos of war, Tarek has difficulties adjusting to life in a refugee camp between thousands of tents and prefab houses.The intelligent boy feels terribly unchallenged in the improvised camp school and is finally expelled because of his rebellious behaviour. From now on he is on his own. Tarek longs for just being a child, he can't handle all those borders around him. The freedom-loving child is also bothered by all the rules that are layed down by his mother. Thus Tarek decides to leave the camp on his own account and to look for his father. His longing for a better life, his curiosity and his courage lead the boy to a group of like-minded people who he encounters in the desert. Together they embark on a journey that will change their life forever. 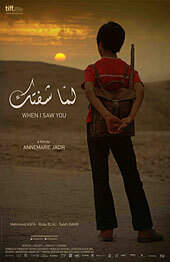 WHEN I SAW YOU is a story of desire, an adventurous journey with the aspiration to be free.